And i'm glad to see the news on the Kepler site of encouraging results from some of the K2 mission viability demonstrations. Kepler has made a test observation of Wasp 28b, proving that it can still detect planets. She's lost another CCD to a circuit failure (for a total of 2 out of 21 detectors offline), but they don't expect that lost to significantly impact the K2 mission functionality. EDIT: Another reason to salivate over K2 is that it'll be surveying stars along the ecliptic, and will be sensitive to near-by star systems. The upshot of that, to me, seems to be that - should we detect a juicy planet inside of a human lifetime's probe-distance, we would have the option to utilise the gravity of the planets of our own solar system to kick a probe out to those systems. That'd be of very little assistance, given the speeds required, but every little helps, right? Not really. If you only want to leave the solar system, you would rather have to rely on gravity assist from stars on the way if a useful route can be made. I'm not sure if it would make sense, though. Gravity assist is only a way to borrow speed. And you can use it to change course which otherwise would cost a lot of fuel. Solar sails could be effective. And the sails could be used to decelerate as it approaches the destination star. I would still take a long time, though. would still take a long time, though. 8 new exoplanet candidates has been detected by astronomers studying with the HARPS(High Accuracy Radial Velocity Planet Searcher) and UVES(Ultraviolet and Visual Echelle Spectrograph ), which is under control by European Southern Observatory in Chile. 3 of these new exoplanets are about the same size as Earth and is located in the "Goldilocks zone" to their host stars. These means that we may have found more planet suitable for microbial and/or intelligent life. These planets are only candiates, they are not verified. If they are verified, there is a possibility they have present life. This needs to be confirmed. The 8 new planets are orbiting around red dwarf stars, which makes over 75% of all stars in our galaxy's over 100 billion stars. No, 3 of the 8 exoplanet candidates are located in a habitable zone, so it is 15, not 20. Kepler telescope with a new discovery. 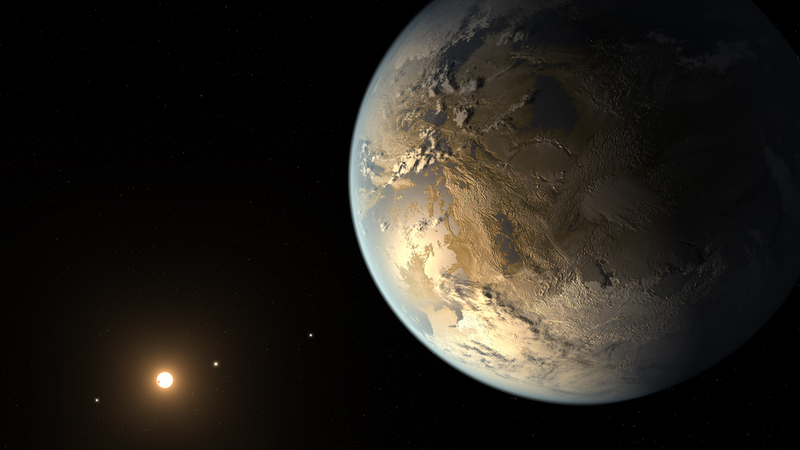 An Earth-sized planet located within a star's habitable zone. This planet is orbiting around a red dwarf star 500 light-years away in the constellation of Cygnus. Kepler-186f is extremely close the size of Earth. So, big news! NASA's Kepler telescope has found a new planet within the habitable zone, and around the same size as Earth, called Kepler 186f. Not sure what else to say on it really. Just some big news a the moment. I have already posted it in this thread. Thread merged, please use the search function in the future. How long until someone makes an addon for this new exoplanet? Considering the post times for Kepler 186f were two minutes from each other, you can't really tell me to use the search function next time. They were pretty much made at the same time. Considering the post times for Kepler 186f were two minutes from each other, you can't really tell me to use the search function next time. He's telling you to search for a thread to make your post in, not to search specifically for Kepler 186 f. Also, it's probably not a great idea to backtalk a moderator when he reminds you of the forum rules.